I love decorating for holidays. 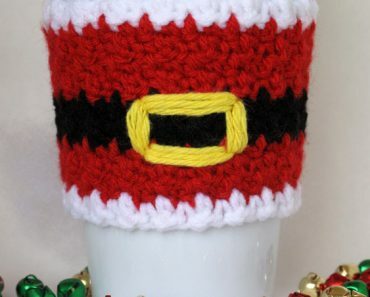 It is so much fun to create my own decorations, one of a kind things you can’t find in stores. This year I designed my own crochet Amigurumi Halloween black cat! Last November, I read about how black cats are the least likely to be adopted in shelters and are also the victims of poor judgement on Halloween. So my family and I decided we could give a good home to some sweet kitties and adopted two black cats that were about 6 months old. 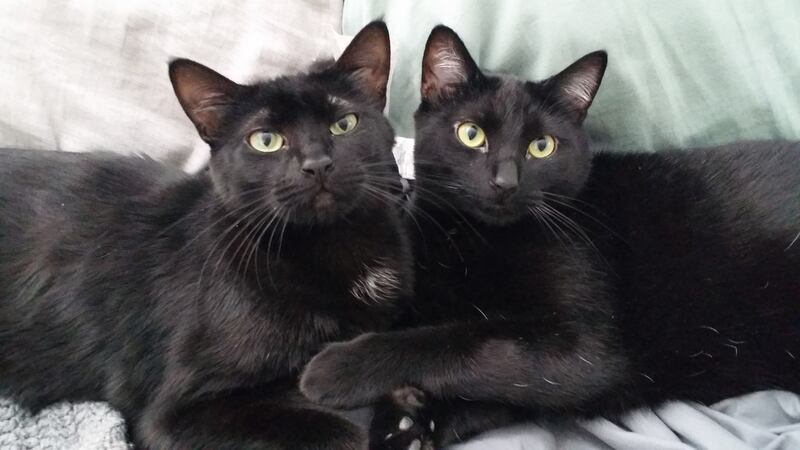 They are named Luna and Jiji, and have brought so much joy to our house! 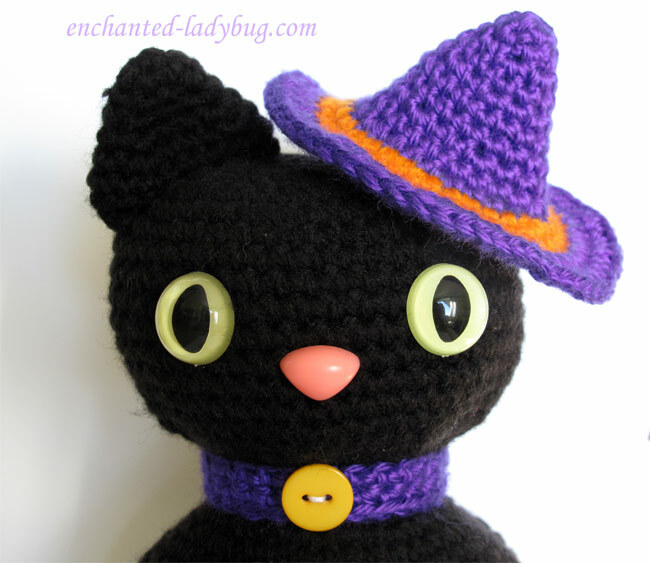 This Amigurumi Halloween black cat is modeled after these two precious kitties! I had so much fun designing this. I like how it came out kind of looking like a dried gourd, it really adds to the fall look! I found the marvelous eyes and nose on Etsy at 6060, I have ordered from this seller before, her products are always fantastic and arrive quickly! The cat measures about 6 1/2 inches tall. After I crocheted the cat, I thought it would look cute to give it a witch hat to add to the Halloween theme. The hat fits nicely over one ear, so it can easily be switched from ear to ear or can be taken off! And of course a witch isn’t complete without her broom, so I crocheted this sweet little broom so the kitty has something to fly around on when Halloween night comes! 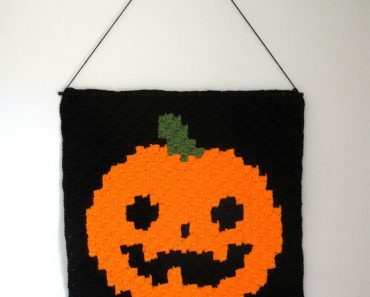 For my crocheted Amigurumi Halloween black cat pattern, I used a 4.25 mm crochet hook. I used Red Heart Super Saver yarn in black for the cat. For the witch hat I used Caron Simply Soft in Iris and Red Heart Super Saver yarn in pumpkin. For the broom I used Red Heart with Love in chocolate and Caron Simply Soft in sunshine. 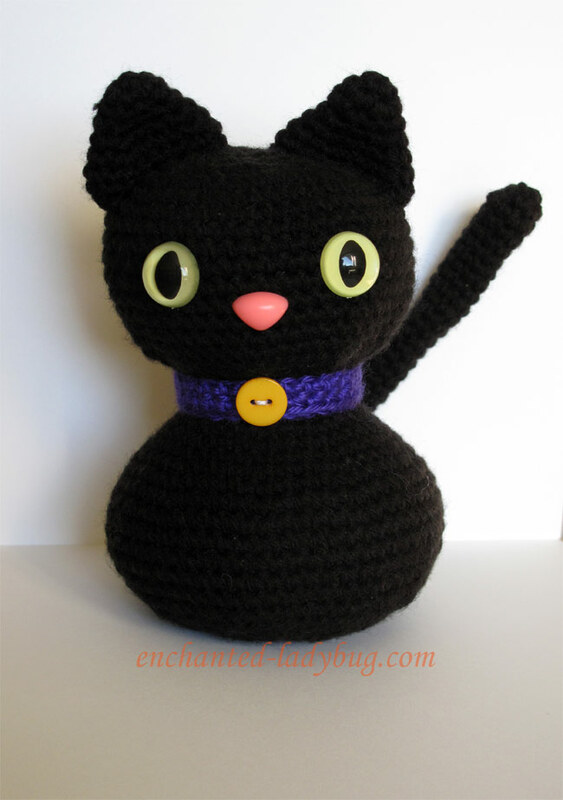 The cat can be stuffed with polyfil doll stuffing, or you can used scrap yarn! I save all of my yarn trimmings and it makes a great stuffing material and you don’t waste any yarn! The eyes and nose can be purchased at 6060 on Etsy! 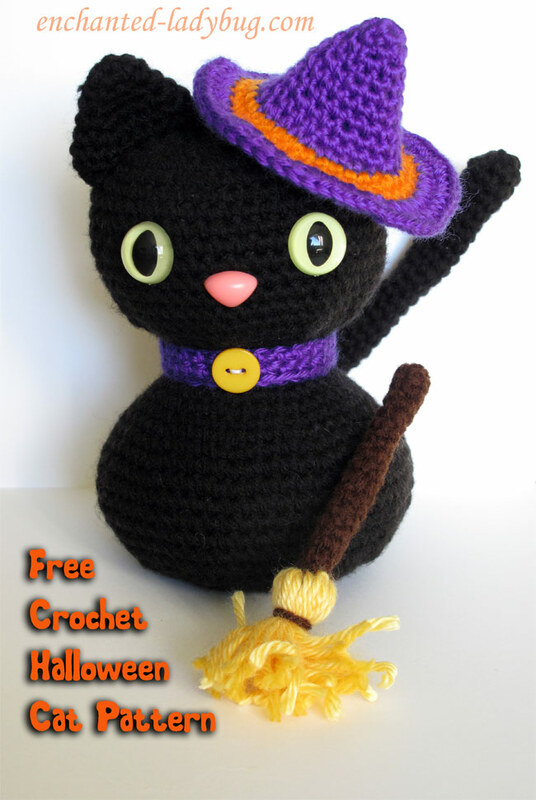 If you would like to make your own crocheted Amigurumi Halloween Black Cat Pattern, you can download it for free below!! Please share your pictures to my Facebook page, I enjoy looking at your creations! 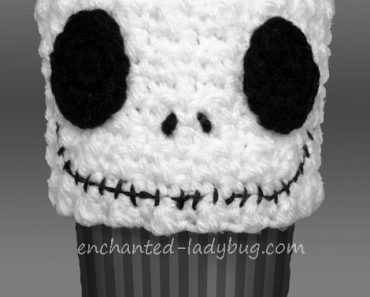 If you enjoyed my Amigurumi Black Cat Pattern, check out my Amigurumi Scarecrow Cat and Crow pattern now available! Thank you for this pattern! I too have a black cat and believe he is the best cat I’ve had. I have though the way they are portrait as bad/evil animals. Yours are adorable!! I love black cats too and they are so misunderstood! 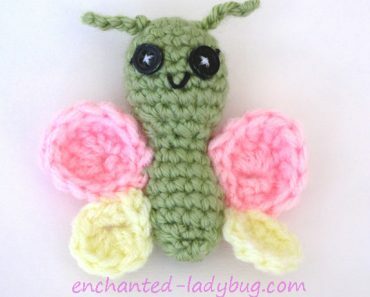 I had to put my sweet Sofie down this year and I think I am going to crochet this little cutie in her memory. 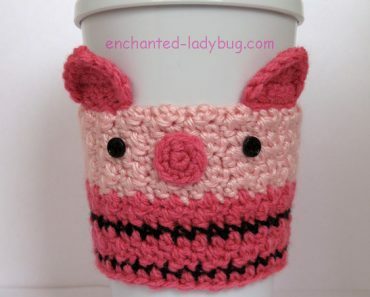 Thanks so much for this free pattern! Do you have a youtube video on how to do this? I’m bad at reading patterns, but can follow along a tutorial. I love black cats. Luna and Jiji are so cute. 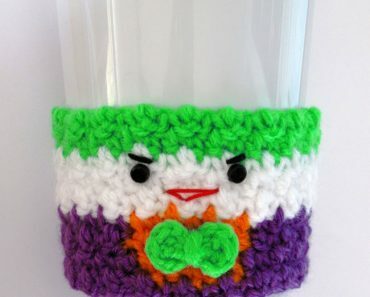 Thanks so much for this free pattern. You’re welcome! Black cats are the best!! thank you for the kitten pattern, my granddaughter has a pure black cat, she named him Davey. He kinda adopted us as his family, where we were living at the time the neighbors were mean and cruel to animals, so he sought refuge with us and he’s been part of the family since. when my granddaughter is away the cat will go through the house looking for her meowing.